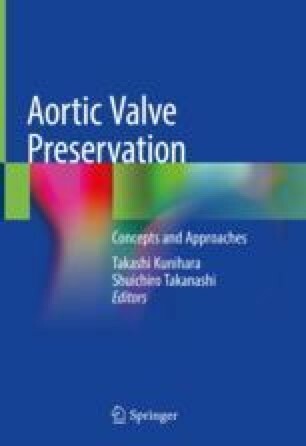 Although valve repair for aortic regurgitation (AR) has gained attention and the application of individual procedures is becoming standardized according to the pathophysiology of regurgitation, repair techniques for the bicuspid aortic valve (BAV) have not yet been standardized. The main reason for this is the diversity of BAV phenotypes. Even considering just the cusps, the level of diversity in the BAV is great as one must consider the presence/absence of a raphe, the types of fused cusps, and the orientation of the commissures. In addition, BAV/AR is frequently associated with dilatation of the aortoventricular junction (AVJ), Valsalva sinus, sinotubular junction (STJ), and the ascending aorta. Thus, there are rather few cases that can be managed well simply by treating the cusps alone. In this article, taking these factors into account, the BAV phenotype, its clinical significance, various repair techniques, and problems specific to BAV are discussed.